OfficeDrop's paperless office service first caught our eye about a year and a half ago thanks to its business-friendly mix of Evernote-like portable scanning and Dropbox-esque cloud storage. We noted a few small flaws with the service at the time, but OfficeDrop has been busting hump since then, smoothing out our storage size complaints and introducing a bevy of user-friendly features that makes the service much more palatable than before. Now those fresh new features are getting a fresh new look thanks to a completely redesigned HTML5 web client, which works on any device and adds a much needed coat of polish to the previously bland browser-based interface. OfficeDrop allows small businesses to upload their documents to the service's online storage servers, where said files are then easily sifted through with the help of OfficeDrop's powerful search and optical character recognition tools. Those files are then accessible through the OfficeDrop apps or OfficeDrop's overhauled web client (which we'll turn to in a bit). You can upload your files in several different ways. The most impressive method entails using the OfficeDrop apps for iOS and Android to take a picture of a document, which is then saved as a searchable PDF that can be crawled by the service's OCR technology. It even works with handwritten notes, though your chickenscratch may vary. Or, you could email a file to (yourOfficeDropNameHere)@myofficedrop.com to upload it to your account. Any file type can be uploaded to OfficeDrop's servers. 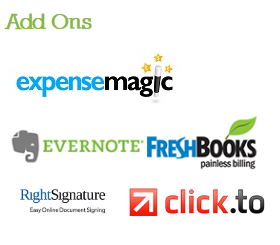 OfficeDrop integrates with many popular services. The SugarSync-esque OfficeDrop Sync desktop client for Mac and Windows PCs lets you cherry-pick any individual local folders to sync with the Web via an "OfficeDrop Sync" option added to your PC's right-click context menu. Any changes made in synced folders are automatically mirrored in your OfficeDrop online storage. Mac users can also download the service's $19.99 "Mac Scanner Software" if they want to add the ability to scan documents directly to the cloud service, or you can upload files through the Web client itself. Once your files are uploaded, you can share them as well as search them. Office Drop also supports a bevy of SMB-focused features, such as multi-user accounts and integration with many popular third-party services, as shown above. In our original look at OfficeDrop we bemoaned the service's 60GB storage cap. Thankfully, that's ancient history in the new business plans, although there is a $24.95 per month Home Business plan that caps users at 50GB of online storage and up to 2,500 OCR-scanned uploads per month. If you have heftier storage needs, the Business Small, Business Medium and Business Large plans offer an increasing number of OCR scan limits, users per account, and online storage space, culminating in the $149.95 per month Business Large's 300GB of searchable storage. That's a big slice of the cloud, but note that individual files are capped at 2GB apiece. Every plan includes a 14-day free trial. Our reexamination of OfficeDrop was prompted by the rollout of its new HTML5 web client, which is already being introduced to multi-user accounts. To be honest, the new interface doesn't really add much functionality beyond what the old interface offered, but it’s a vast aesthetic improvement over web client's previous clunky look. That's a large positive in and of itself. OfficeDrop's web app is much more polished than before. The old web client is still poking around until OfficeDrop integrations with third-party services like Evernote are fully supported in the new interface, which representatives say should occur before the end of the year. OfficeDrop's new HTML5 Web client may be the feature that caught our eye, but it was the service's much improved feature offerings that convinced us to stick around. Between the myriad uploading options, powerful OCR technology and greatly expanded storage plans, OfficeDrop is a strong contender for any SMB looking to digitize their documents and free themselves from the tyranny of physical filing cabinets. Just be mindful of those upload limits.